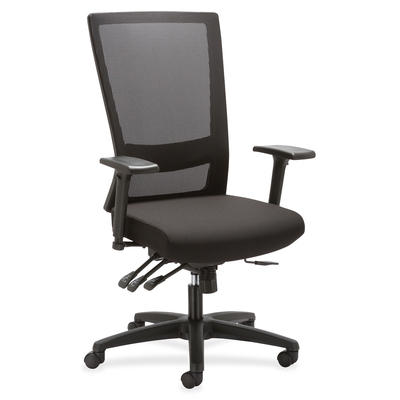 High-Back Chair Offers A Breathable Mesh Back That Conforms To Your Body For More Comfort. Fabric-Upholstered Seat Is Cushioned And Adjusts From 17" To 21-7/13" High And 18-4/21" To 20-4/25" Wide. Arms Are Covered In Polyurethane Foam And Adjust In Height And Width, And The Chair Features Seat Glide And Asynchronous Control So You Can Find The Best Sitting Position. 28-7/25" Diameter, Five-Star Base Is Made Of Glass-Filled Nylon And Is Equipped With 50mm Hooded, Dual-Wheel Casters For Easy Chair Movement. Weight Capacity Is 250 Lb..
High-Back Chair Offers A Breathable Mesh Back That Conforms To Your Body For More Comfort. Fabric-Upholstered Seat Is Cushioned And Adjusts From 17" To 21-7/13" High And 18-4/21" To 20-4/25" Wide. Arms Are Covered In Polyurethane Foam And Adjust In Height And Width, And The Chair Features Seat Glide And Asynchronous Control So You Can Find The Best Sitting Position. 28-7/25" Diameter, Five-Star Base Is Made Of Glass-Filled Nylon And Is Equipped With 50mm Hooded, Dual-Wheel Casters For Easy Chair Movement. Weight Capacity Is 250 Lb.